The beer went on sale in the Ostrich, North Street, Peterborough yesterday, and will soon be available at the Prince of Wales, Castor, and the Hand and Heart, Highbury Road, Peterborough. 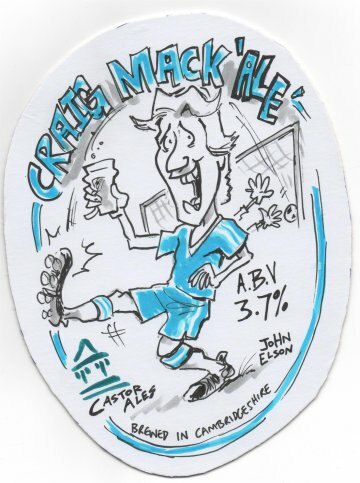 Duncan friend’s local artist and ET cartoonist, John Elson drew the pump clip in the pub on Monday night, to be displayed with ‘Posh pride’ on the pump clips of the pubs. Duncan hopes to be able to present Craig with the original artwork, when he leaves Posh. The beer is a limited edition in Peterborough, but is likely to be found in Norwich, Liverpool, Wigan or London in the near future! Local brewer and local historian team up to resurrect a City legend. Local brewer Duncan Vessey of Castor Ales and Brian Gascoyne, local historian and landlord of the recently opened Crown Inn in Lincoln Road have teamed up to commemorate a 16th century Peterborough legend: Old Scarlett. Brian suggested to Duncan that the Old Scarlett legend needs to have a higher profile in the city, and that it would be fitting to have a local beer named after him. So Duncan has produced a new beer from Castor Ales named Old Scarlett, which will be launched at the Crown at 2pm, Friday 21st january 2011, and in the presence of the The very reverend Charles Taylor Dean of the Cathedral. The pump clip for the beer has been reproduced by John Elson, the ET cartoonist, from a portrait in the cathedral. Robert Scarlett, Sexton of St John’s Church, Peterborough, died on July 2, 1591. As Sexton, he swept the churchyard, rang the bell and buried the dead of the Parish. He also dug graves for other churches in and around the city and when he died at the remarkable age of 98; he had buried two generations of the population of the city, which would have been about 1,500 at that time. As well as the good and the righteous, Old Scarlett also buried two queens! Catherine of Aragon, the first wife of Henry VIII whom he divorced died in 1535 at Kimbolton Castle. She was buried in Peterborough Cathedral where she still lays to this day and her burial is commemorated in the city later this month. 52 years later, he buried Mary Queen of Scots who was executed by beheading at Fotheringhay Castle near Oundle in 1587. Her body was later exhumed and re-buried in Westminster Abbey when her son James I of England (or James VI of Scotland) became King. In commemoration of this remarkable son of Peterborough, Castor Ales is proud to produce an ale bearing his name and launch it in the month of the 476th anniversary of the burial of his first Queen, Catherine of Aragon. The dark colour reflects the trade he mastered during his 98 years and 10 months of his life, and the fresh fruity taste reflects the spirit and longevity of a man that would be considered remarkable even in this day and age! Castor Ales has been brewing since August 2009, and supplies regularly to the Prince of Wales Feathers in Castor, the Ostrich in North Street, the Beehive, Albert Place and the Plough in Werrington, and other free houses in the area, and many beer festivals. Other beers include Roman Gold, Edmund Tyrell Artis, Castor Oil, Castor Clout and Castor and Pollux. Castor Ales, Peterborough’s newest brewery delivered its ale to the beer festival on Saturday only weeks after completing the brewery. Ufford Ales have increased the capacity of their operation because of the popularity of their craft produced ales, and the Ufford based brewery was more than happy to help Duncan set up the brewery in Castor. Simon and Duncan’s target was to give Castor Ales the best start possible by producing real ale for the Peterborough Beer Festival, the biggest regional festival in the country and the local CAMRA branch that organises the festival openly encourages new breweries. It seemed an impossible task when the brewery was still a building site 6 weeks ago! But local builder Maffit Construction completed the building works with a few days to spare. Simon, who helped Duncan fit out the brewery and lent a big hand during the brewing process said: 'Duncan has a passion for real ale, and I have been pleased to help him set up and hopefully the result will be welcomed by the real ales drinkers at the beer festival’. The community of Castor and Ailsworth has welcomed Castor Ales and many people have offered their support and assistance. Castor Ales has produced two beers: Roman Gold a 3.7% golden ale, and Serene Nene, a 4.5% best bitter, and both will be available at the Peterborough Beer Festival. "Castor Ales" is a new brewery dedicating itself to the production of fine quality real ales. The brewery is located in the village of Castor, on the outskirts of Peterborough. Castor was the location of an important Roman settlement and the Roman palace (c. 250 AD) was the second largest Roman building in Britain. The area was a Roman industrial site where pottery known as 'Castor Ware' was produced. These days the village is a thriving community with two good pubs and one good restaurant. It has an active community with interconnecting businesses that reach out to Peterborough and beyond. Castor Ales Brewery supports the local economy and provides beer with a minimum of food miles and low carbon footprint. It does not sell beer through supermarkets but to local independent retailers.